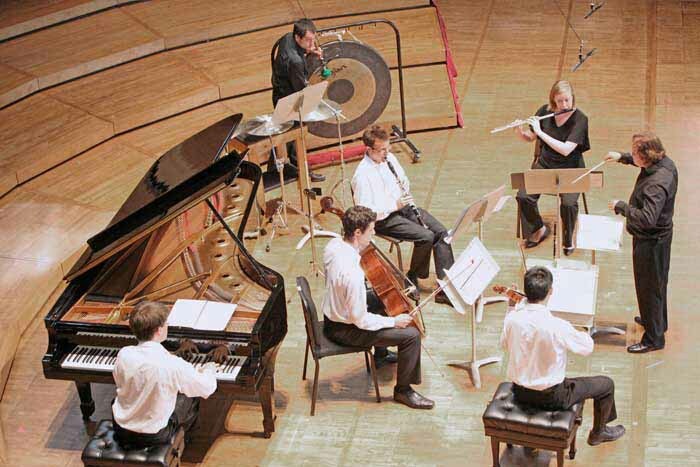 The Fromm Concert on Sunday morning, like the rest of Tanglewood’s Contemporary Music Festival 2012, was curated by the famous English composer and conductor Oliver Knussen. He cleverly chose repertoire by older composers (Harrison Birtwistle, the late Niccolò Castiglione, David Del Tredici), not-so-old composers (George Benjamin, Marti Epstein), and young composers (Helen Grime, Sean Shepherd). These composers have distinct styles, which provide much variety. The concert also had an interesting juxtaposition of instrumentation, listed in performance order: Chamber, conducted chamber ensemble, solo piano, string quartet, and after intermission, solo piano, conducted chamber ensemble, and chamber music. The program began and ended with quartets; three oboes and a harp to start, and an oboe quartet (oboe, violin, viola, and ‘cello) to finish. Since it’s unfair to judge a piece of music on one hearing, this review contains subjective observations rather than pronouncements. The well-attended concert opened with British composer Sir Harrison Birtwistle’s Dinah and Nick’s Love Song (1970), a wedding gift to a student that was written for three identical melodic instruments (at this performance, oboes) and a harp. Harpist Grace Browning and one oboist, Graham Mackenzie, walked onstage and bowed. Only after the piece began did the audience realize that the two other oboists were indeed present, but one in opposite side balconies. Dinah and Nick’s Love Song sounded especially good in the wonderful acoustics of Ozawa Hall. The playing was soft and sensitive, which is difficult on the oboe. The harp played a sicilienne rhythm, and we were convinced that Birtwistle’s love of Greek mythology was conveyed by the instrumentation of reed instruments and harp, along with the composition. Considering the spatial relationship of the oboes, their group entrances were usually together. This short piece was a very effective opening to the concert. (My most striking memory of Birtwistle was his acceptance speech at the televised Novello Awards for songwriting and composing. He sauntered over to the microphone and said “Why is your music so F…ing LOUD?!! !” referring to various other genres. …) The oldest living composer on the program, he was born in 1934. Tropi for chamber ensemble, by Niccolò Castiglione (1932-96) was conducted by a young and talented Englishman, Jonathan Berman, who possesses, in addition to a thorough knowledge of his scores, a lyrical yet precise conducting technique. Tropi means tropes, notes added to text. The piece begins excitedly, with no recognizable tonal center. Lines are pointillistic. A lyrical passage follows. “Percussion” instruments (cymbals, tam tam, and piano) seem often to play sustained lines. There are many sections that combine the high ranges of violin, flute, and clarinet. The pianist occasionally plucks strings inside the piano. And there is some col legno playing by the cello. About five minutes into the piece, there are nice melodic lines in the violin (Alex Shiozaki). The ensemble did its best to make the most out of this piece, which is rich in tempo and dynamic contrasts. Marti Epstein, born in 1959, is a fixture in the Boston music scene, especially at concerts of contemporary music. She teaches at The Boston Conservatory (affectionately known around town as BoCo), and is a professor at Berklee College of Music, where her class on modern music is legendary. Her Hidden Flowers for string quartet, commissioned by the TMC at the request of Oliver Knussen, refers to one of the Love Sonnets by the famous Chilean poet Pablo Neruda. The piece begins with harmonics and non-vibrato playing, cleanly executed by the quartet. There is a static quality to this opening that could be described as minimalistic, though there was much subtle linear movement. The second section relieved by adding the lower range, especially in the cello, though a whole-step sighing motif continued in the first violin; Epstein clearly gets the most out of a melodic idea. Some ponticello sounds add a welcome color change. A prominent yet infrequent descending interval of a seventh was a nice contrast to the ethereal background. The piece’s final section was chordal, written with a rich harmonic vocabulary and some interspersed subtle tremolos. The piece was written with good independent lines for each instrument and was well played. Of all the pieces on the concert, this was the most atmospheric, though maybe not for a listener who is in pursuit of obvious pulse. It has a timeless quality and would add much to a movie with little action. The second half of the concert began with Soliloquy for piano by David Del Tredici, written at the Aspen Music Festival when the virtuoso pianist (later turned composer) was 21. (Upon hearing the piece, French composer Darius Milhaud, who was teaching that summer (1958), exclaimed, “My boy, you are a composer.”) Del Tredici is especially known for his large-scale, extremely tonal orchestral pieces, often based on Lewis Carroll’s works. In Soliloquy, Del Tredici wrote in an often dissonant style. Helen Grime, the youngest composer on the program, was born in 1981 in England but grew up in Scotland. Like Arnold Schoenberg’s Pierrot Lunaire, her Seven Pierrot Miniatures is based on poems by Albert Giraud and employs an ensemble of flute, clarinet, violin doubling on viola, cello, and piano, though there is neither recitation nor singer. Unlike Schoenberg, Grime chose different poems and she usually writes for the full ensemble instead of various combinations of these instruments. The first movement, “The Clouds,” sounds like clouds! “Décor,” well played by the ensemble, is short and startling. “Absinthe” features solo viola and clarinet; evidently, Grime tasted the beverage, and reacted musically. (Incidentally, Leonard Bernstein drank it, too.) In “Suicide,” one hears the agony, along with a few stabbings. “The Church” begins with solo flute. This one doesn’t seem to be terribly happy, incorporating some key slapping by flutist Martha Long (She has recently been appointed principal in the San Antonio Symphony.) Eventually violin and cello join in, representing a quiet hymn in the background. “Sunset” employs bass clarinet arpeggios and scales in flute and violin. Not exactly Strauss’s Alpine Symphony, sunset must be dark in Giraud’s setting. Helen Grime happily congratulated players on stage, after one of the most meaningful performances of the morning. Sean Shepherd, who was born in 1979, wrote his Quartet for Oboe and Strings in 2011. Supposedly, Mozart’s oboe quartet influenced Shepherd, but as he wrote in a totally different harmonic language, the similarity is not striking. Strings accompanied and punctuated the clean playing of Graham Mackenzie, whose interpretation was more gentle than Liang Wang’s, the New York Philharmonic’s principal oboist, for whom the piece was written. Cellist Michael Dahlberg’s warm playing added a nice change of color in the second section. Perhaps the composer would have allowed a freer approach in the solo oboe cadenza. The penultimate section was intimately played, with string harmonics and cello pizzicato sensually accompanying the lyric oboe writing, leading to a brief viola solo, well played by Derek Mosloff. 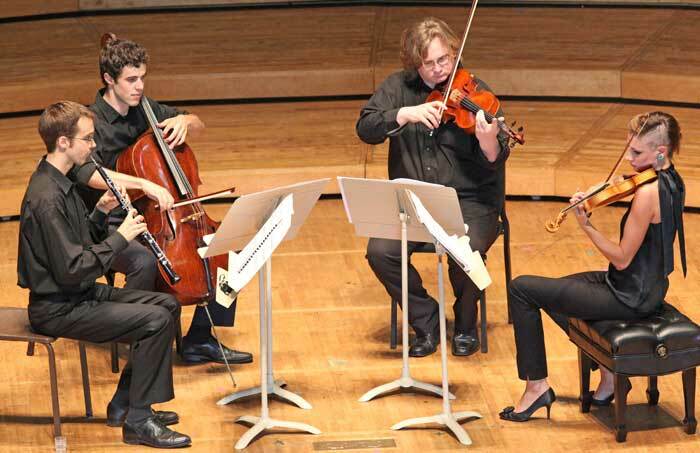 A dotted-rhythm accompaniment concluding with a quiet unison pizzicato brought the piece and another very successful Tanglewood Festival of Contemporary Music concert to a happy end. We admirers of contemporary music and its composers thank the Tanglewood administration for continuing to provide us with the festival. Thanks also to program note authors Robert Kirzinger, Claudia Carrera, and Christian Carey for their excellent research, which informed much of this review. Seeing and hearing young people so skilled and dedicated to music (especially new music) proves that serious music is certainly not in decline.